Can New Water Discoveries Save East Africa? East Africa sees almost year-round skirmishes over water and grazing rights among the pastoral groups that live along the Ethiopia-Kenya and South Sudan–Central African Republic borders. Water scarcity is becoming the defining international crisis of the twenty-first century. Water conflicts rage across the world as communities struggle to secure clean, reliable supply One of the world’s most water-stressed regions is East Africa. Overexploitation of water resources there has been compounded by declining snowpacks on Mount Kilimanjaro and Mount Kenya, which have shrunk since the late 1980s due to global warming. Meanwhile, Lake Turkana — the world’s largest perennial desert lake — has largely disappeared from Ethiopian territory, retreating south into Kenya. In this light, the discovery of two significant aquifers in the largely arid Kenya by a Japanese-financed UNESCO project has been hailed as a potential game changer. The first, the Lotikipi Basin Aquifer, is situated just west of Lake Turkana. The second, the smaller Lodwar Basin Aquifer, is near Lodwar, the capital of Turkana county. The aquifers were discovered by a French firm, Radar Technologies International (RTI), using a space-based exploration technology called WATEX that was originally designed to reveal mineral deposits. The company blended satellite and radar imagery with geographical surveys and seismic data to detect moisture. Subsequent drilling by UNESCO confirmed the presence of aquifers. Three other suspected aquifers in the region have yet to be confirmed through drilling. For parched and economically backward Turkana, more than one-third of whose residents are malnourished, the discovery of major groundwater reserves is a godsend. Not only will they provide lifesaving water, they will spur agricultural and hydrocarbon development and improve the lives of the impoverished residents in this conflict-ridden region, which extends from Kenya into the borderlands of Ethiopia and South Sudan. Turkana boasts hydrocarbon deposits. Since the new water can be piped to other regions as well, the aquifer finds are good news for Kenya as a whole. Whereas global per-capita freshwater availability averages slightly above 6,000 cubic meters per year, in Kenya it has fallen well below the international water-poverty threshold of 1,000 cubic meters. Two-fifths of the country’s population thus lacks access to safe drinking water. In addition, more than half do not have adequate sanitation, and water scarcity acts as a serious constraint on socioeconomic development and environmental protection. The water problem, of course, extends beyond Kenya’s borders, as highlighted by the current humanitarian crisis in the Horn of Africa wrought by prolonged drought and erratic rain patterns. Internal conflicts have exacerbated water and food crises. For example, with political conflict disrupting South Sudan fragile, agriculture-based economy, the country faces the specter of Africa’s worst starvation since the 1980s. The United Nations’ Intergovernmental Panel on Climate Change recently warned of increased drought stress in the parched regions of Africa, such as East Africa. 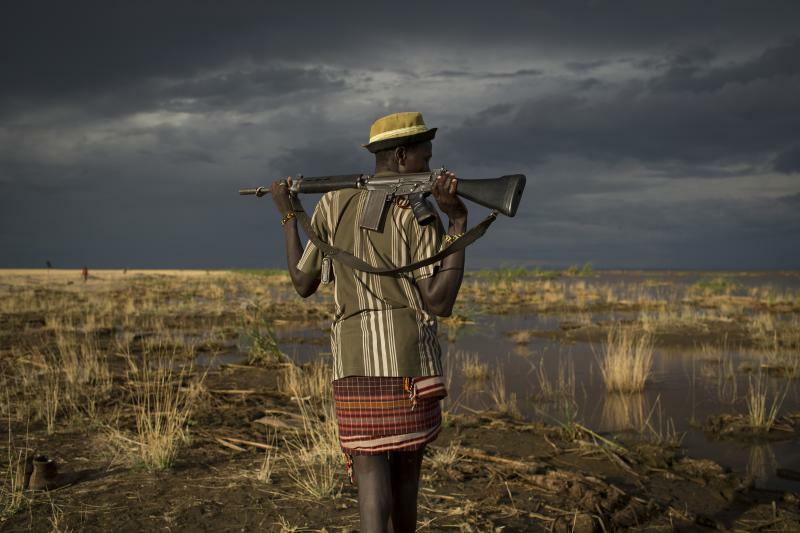 East Africa sees almost year-round skirmishes over water and grazing rights among the pastoral groups that live along the Ethiopia-Kenya border and the South Sudan-Central African Republic border. As freshwater bodies dry up or recede, pastoralists have to search more widely for water and grazing land, bringing them in conflict with other herdsmen doing the same. Lake Turkana, for example, has progressively retreated from Ethiopia, and Ethiopian Dassanech tribes have moved further south with the water’s edge into Kenyan Turkana territory. In recent years, anger and frustration between the two groups has boiled over into recurrent armed clashes, aggravating military tensions between Kenya and Ethiopia. More broadly, regional tensions between tribes and ethnic groups have been exacerbated by the hundreds of thousands of water refugees who have streamed across provincial and international frontiers since 2011 alone. For example, a severe drought and famine in 2011 forced tens of thousands to flee southern Somalia for Kenya and Ethiopia, where many still remain camped. In recent months, more than a quarter million South Sudanese have fled to neighboring countries and 30,000 Turkana pastoralists have taken their cattle to Uganda. The flow of thirsty refugees has stoked political and tribal tensions, and put a strain on their host governments. The region is producing not only parched refugees, who seek to relocate far from their native villages, but also water warriors. Criminal gangs and warlords control many wells. Their guards have opened fire on thirsty villagers for trying to withdraw water. The use of such tactics in water-scarce areas means that the weakest and the poorest are the worst hit. Against this grim reality, the aquifer finds in northern Kenya seem like a beacon of hope. The firm RTI estimates that its largest discovery — the Lotikipi aquifer — holds at least 250 billion cubic meters of water, which is equivalent in volume to Lake Turkana’s current capacity. It also contends that the aquifer has an impressive annual recharge rate of 3.4 billion cubic meters, which is the amount of water naturally replenished by rain and thus open to sustainable human extraction. However, finding this hidden water wealth is just the first step. Only a detailed scientific study can reliably determine both the quantity and quality of the water underground. An independent study will also be needed to determine the real replenishment rate, a critical piece of information if Kenya is to sustainably exploit its new groundwater reserves. Reckless extraction could leave little water for future generations. Further, even if RTI’s estimates are validated by further study, Lotikipi’s reserves are not as large as media reports (which routinely use adjectives such as “huge” and “massive”) have made them out to be. The estimated total reserves can meet the needs of the Turkana region’s residents for no more than 70 years. And the RTI-assessed recharge rate is equivalent to about two times the yearly water use of a large city such as Chicago or London. But there are 43 million people in Kenya, including about a million in Turkana, currently battling a year-long drought. In comparison to Lotikipi’s supposed reserves of 250 billion cubic meters, North Africa’s mammoth Nubian Sandstone Aquifer System — shared by Chad, Libya, Sudan, and Egypt — holds as much as 540,000 billion cubic meters, although the extractable quantity is estimated to be about 15,340 billion cubic meters. Lotikipi’s reserves thus need to be exploited judiciously — an onerous challenge in a drought-ravaged region. The water must be used to douse the resource wars in Turkana. Developing agriculture in the region — which is currently nonexistent — and employing people to work on new farms could also help. Yet given the raging conflicts in the region, building the infrastructure to tap Lotikipi’s resources and then safeguard it will be no easy task. One concern is that the real beneficiaries of the aquifer finds may not be the residents of Turkana, Kenya’s least-developed region, but the better-off Kenyans to the south. To prevent that, Kenya needs better governance and more equitable regional development. Otherwise, it could breed internal conflict as has happened in some resource-rich regions of Africa. The continent has more recently become the scene of a resource-related Great Game among world powers seeking to extract resources in mineral-rich areas. With the aquifer finds, Turkana now boasts both water and oil resources. Yet the challenges in this backwater mirror the larger challenges in Africa — how to prudently manage water and mineral resources and integrate them with development so that local communities, not outsiders, actually benefit. BRAHMA CHELLANEY is a geostrategist and the author of Water, Peace, and War: Confronting the Global Water Crisis (Rowman & Littlefield, 2013) and Water: Asia’s New Battleground (Georgetown University Press), which won the 2012 Bernard Schwartz Book Award.